Hey guys, I just re-did my mock draft for the start of the 2011 season. Completely overhauled the site so I would love to hear your feedback on both the site and the mock if you don't mind. Site looks great! Can't say much about the mock yet. Have to do some research. I couldn't read the commentary you posted on some of the picks because the background was much too dark. Fix the font color on those would be my first suggestion. Thanks for the feedback, which picks are you having trouble with? It seems to have improved somewhat....but I am looking at it on a different computer. Still, there are areas where you have colors that are fading in/out and it gets kind of difficult to read either the black or grey font, depending on the background color. Please don't take any offense....the site is very attractive and your information is really good. I like the graphics for the teams and the players they are picking. But after yesterday, you may want to adjust the draft order. LOL. Some real surprises. Good job on the site. Please keep it up to date. Too often people make draft sites well in advance and then don't touch them for months on end. If you want to maintain interest, I would say update it at least twice a month for the first two months of the season, then once a week thereafter. The more people notice you updated it, the more they are likely to return to see the changes. Thinking ahead, what positions do we need to address in the 2012 draft. I realize that it's VERY early in the season, and that the Lions don't address positional needs during the draft. But somewhere along the line they have to consider it. While I have no issues with how Backus has performed thus far, we still don't have an apparent successor to him on the roster. Fox is too injury ridden, and Hilliard is the RT answer, not the LT answer. If I'm not mistaken, Wright and Houston are both on one year deals. One of them could be on a two year deal. Regardless, we need to get a corner to develop as our shutdown guy. Right now, nobody on our roster qualifies as that type of guy, even those two. KVB isn't the force he used to be, though his energy and leadership are still infectious. LoJack and Avril would be good bookends as starters, but I'd love for the Lions to get a real stud DE if one is there. Is Willie Young that guy? Too early to tell, but I don't think he is. What I said about Backus goes double for Raiola. He may be a very intelligent guy, but the DTs aren't going to stop rushing our QB to ask his opinion about quantum physics. We need a bigger, run blocking mauler at center. Tulloch is on a one year deal. I think the Lions make every effort to re-sign him next season, and make it a priority. Durant has a two year deal and Levy is about to finish his rookie deal. We'll need a replacement soon, for at least one of them. Bobby Carpenter isn't likely to be here beyond his one year deal he signed this year. I'm just glad we are a BPA team. While I agree that we need to bring someone in to succeed Backus and that person doesn't seem to be on our roster I would hate to have a first rounder sitting for 3-4 years until Backus retires. Though he could be graet trade bait at that point. Houston signed a two-year deal, Wright a one year deal. As for the draft, injuries could always play a factor and FA (especially our own) will play a big role as far as needs. Honestly I think we continue to go BPA for the most part, especially early in the draft. I think you will continue to see this team invest heavily in the DL via the draft as a general philosophy. We really need to start getting younger along the OL or face a total overhaul much like the Cowboys this year. So much of this franchise rides on Stafford right now, gotta continue to work on his protection. I could see the team invest a high pick on an athletic OT who may start on the right side and later switch to the left. RG would be a nice spot to upgrade given Peterman's performance in 2010 and thru the first two games. Ideally we will be drafting for depth and not dependent on draft picks, much like this year. Who would have dreamed the Lions would have spent their top pick on a DT this year, certainly not me. Let the draft fall to you and grab value. We are not in the process of building as much talent as we can, not plugging holes through the draft (and what a nice spot to be in). Actually, I pretty much hope we are done going the expensive Free Agent route. I say, sign our own and draft BPA. We have no massive holes in the dyke anymore. It's now time to become a player mill for the rest of the league to sign after we have used them up and released while they still have value as a comp pick. LOL. If we don't get them traded first. I didn't say expensive I said young and talented. Not all good FA's need to be deal breakers. But I agree, huge FA's are killer for team building. 28th against the pass, but in what way? Total yards? Yards per pass? We've played two teams where they were trying to catch up to us. As such, they were throwing a bunch more than usual. So, if the stat is that we're 28th against the pass based on total yards given up through the air, then so be it. When opposing teams are trying to close the gap, they throw the ball. And they are going to get their yards. Now, let me put it another way....we've given up 1 TD in the air, but have four picks so far. I'd say we're better than 28th against the pass. points againts! That is the ONLY defensive stat that matters at the end of the day. well that and T.O.'s. those two tell you everything you need to know about defenses. 1. RT - Immediate need. Hilliard is not the answer though he s been better than Cherilus the last two weeks. The best hope is more time for Cherilus to heal, ie IR him and see what he can do next year better rehabbed off his knee surgery or seeing what Fox can do. Hilliard throws his body in front and goes for a ride. He doesnt use his hands or feet very well and doesnt have much power blocking ability either. 2. LT - Backus has never really been much more or less than an average player. When he starts to decline I have a feeling it will be dramatic. Maybe one of the two tackle slots can be filled with current players like Fox or Culbreath, both are inexperienced though and if you can get a good projectable immediate starter in the draft, we have to take it. 3. ROLB - Immediate need. Deandre Levy is playing poorly and other teams are seeing it on film. The Vikings game plan was to attack him and it worked very well. Other teams will follow suit. Its possible that Hogue, Palmer or Carpenter are the answer but wouldnt they be ahead of Levy or shouldnt they be soon? 4. RG - Stephen Peterman played better vs the Vikings but isnt the same player he was 3 seasons ago which is too long of a waiting period for a good team which is what we are now. 5. RB - We will give LeShoure every opportunity to come back but there will be another opening for another player and if the value is right why not take another shot in the draft. Morris' contract will expire so that is one potential slot, Harrison is on a one year deal, and Williams is as well, plus we currently do not have a dedicated FB. Position is subject to turnover. 6. DE - KVB is still getting it done and takes great care of his body. Still the age has to be a factor. I think Lawrence Jackson could be a decent 3 down starter with Willie Young slotting in as a pass rush specialist but if there is a chance to get a big time DE in the first 2 rounds of the draft it would be a boost and that player would have the luxury of not being pressured to produce along the way. CB - not a need. All we need to do is re sign Eric Wright and extend Chris Houston again into the offseason. Both were very undervalued by the teams they came from and their weaknesses are covered by the strength of our DL. Aaron Berry is a decent prospect who has room to grow but so far holding his own as a nickle back where we have viable alternatives in Brandon McDonald who is a run stuffer that could probably be a better linebacker than Deandre Levy right now and Alfonso Smith who gambles but has a tendency to make the big play. OC - not a need. Maybe we could use a guy eventually but Raiola is actually pretty good even if I think I could bullrush him - he has survived several coaching changes with that same weakness. He blocks well up to the second level and has great feet and athleticism which has not dropped off at all. I think Raiola will be our center until age 36. LLB/MLB - Durant is the answer and Tulloch needs to be resigned. Levy wont see a second contract with us so the money spent on Durant/Tulloch will be patially saved by going with a rookie to replace Levy. I have to disagree about Levy not getting a second contract with us. Schwartz and Gunner love this kid, and if they are still here they will want him re-signed. I don't know what it is about him this season that has him playing sub-par, but I don't see the coaches giving up on him this quickly. 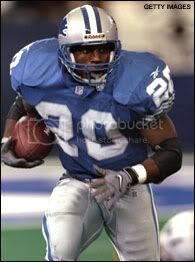 As for corners, I'd love to see the Lions re-sign Wright and extend Houston. The problem is I'd like to see the Lions get a really good corner to develop for the future. So far, I'm not impressed with Aaron Berry, even in the nickel role. Maybe he needs more time, but he's not playing all that well. Brandon McDonald and Alfonso Smith aren't starting quality CBs. I'd like to see the Lions get a stud CB, but only if one of value falls to them. It's not a critical need, unless either Wright or Houston leaves. I can't argue about the tackle positions. I am sort of wondering if the Lions are going to bring Culbreath up anytime soon. Particularly if Fox isn't close to returning. As for being OK at center, I disagree. Raiola is part of the reason we can't run the ball well. He gets manhandled constantly. He may be intelligent and make great line calls, but there are other centers who can do the same that have the size and strength to hold their ground, or move a DT as needed. The Lions cannot stand pat at the position. After the left tackle spot, I believe the center spot is the second most important position on the o-line. Good teams typically have really, really good centers. It was the reason I wanted the Lions to go after Jonathan Goodwin in free agency. He could replace or backup either guard position as well as center, and do a fine job in the process.